Is Rohit Sharma the most entertaining modern day batsmen? Thread: Is Rohit Sharma the most entertaining modern day batsmen? He is one the most entertaining players , but not the most . For sustained hitting Rohit, ABDV, Gayle when in the zone. He is six hitting monster. His six per innings in ODI is better than Afridi or Gayle or ABDV. Unlike Afridi he is so easy on the eye. Australia no minnows. He made. 200 plus against them hitting 16 sixes. Really enjoy this guy's batting. He's such a natural strokemaker and very pleasing on the eye. Once he's in, that's it, he's very difficult to remove. Best advice is - get him early. Last edited by Savage; 23rd December 2017 at 00:59. Once he's set, there aren't many more who are entertaining. Fabulous LO batsmen. Amir does a wonderful job at that. He always removes Rohit for nothing on the first couple of overs. Yes, he can get into a zone where, bar maybe ABD, I've not seen many batsman go. Makes everything look elegant and effortless. Has the classical eye catching style but also a 7th gear, insanely gifted batsman. When in the zone, there is no one better IMO. Kohli and AB don't hold a candle then. Most? I don't find him entertaining at all. Would much rather watch Kohli, Rahul or Pandya go to work. Next 27 balls 91 runs. 27 balls 12 sixes !!! Just saw the highlights of his batting. Man that was some insane hitting, most of sixes were landing in tier 2 stands and some even tier 3. Lanka been demolished here by Captain Sharma. Actually KL Rahuls's sixes were breathtaking as well. In any other match it would have been the highlight of the innings. Rohit managed to eclipse him. I didnt get to see Rahul's batting. As on youtube i only managed to get Rohit's innings. But maybe ill try to catch the entire match highlights. I have always supported Rahul and wanted him to be part of our ODI setup as well instead of TTF Karthick. I hope Rahul now manages to secure his spot in Indian lineup. Wish we could somehow get Pant in our lower order and we would have devastating lineup that can match blows with blows. watch here. Just watch the way KL Rahul brings down the bat. It is poetry in motion. Amazing to watch. Ashwin described him well "painting those big hits like an artist"
Sharma is a quality player but has not showed his performances in knockouts unlike Dhawan. He is still a tremendous player and a 35 ball ton is nothing to scoff at. I am not sure Dhawan made any impactful innings in T20 knock outs. When on song, he goes to ABD mode, simply far more destructive than Kohli and anyone else. I don't care about his stats nor where he scores on flat or on green but i do enjoy watching him bat more than vk for sure. Yes, but only he gets going. I find Kohli and Rahul more entertaining in the Indian team. Overall, Warner is by far the most entertaining cricketer. A useful and competent flat track bully. Nope AB provides more entertainment per innings, Rohit is a FTB and his innings for early part is boring to watch. 3.209 against(Mckay,coulter nile,watson,faulkner)Clint mckay was consistently ranked amongst top 10 bowlers at that time. This is more than enough to prove u wrong. His 137-138 vs aus in tri series (2015) was one of the best innings he has played till now when starc was on fire. To be honest yes, he's up there. Been a fan of his batting since I saw him play for the Deccan Chargers in IPL 1/2. ...Except against us, he can't do jack. Maybe not amir.That's probably because he doesn't consider him as quality bowler.He struggles in swinging condition which is not surprising. I can only provide instances to support my claim.In 2010 T20WC,He played terrific innings of 79*(46) while india were all-out for 135.He scored runs against Nannes,Tait and Johnson in that match.He also dominated Peak johnson in 2013 odi series.Johnson failed to dismiss him even once while Sharma managed to score more than 500 runs in that series.In 2015,He again scored century against Aussies in MCG.M starc took 6 wickets while Sharma scored more than 50% of india's total.He also scored T20 century against SA attack(which included Rabada)later that year.Scored most runs in that ODI series for india against SA(which included Steyn,Rabada and Morkel).Even in recent odi series against Australia,He dominated Cummins and N coulternile(bowled really well in that series) while Kohli failed to hit more than 2 boundary against them in that series. I think that's enough to suggest he can dominate Quality pacers. Okay.. The one against Starc was arguably his best ever inning in Melbourne. His 150 against Steyn in India was another high quality one. Yes, the pitches were flat but he played excellent innings and credit for that. There are other instances too. He got runs Vs Boult and others too. I never made any argument in the first place. There are other instances too. He got runs Vs Boult and others too. Tbh i don't think he dominated Boult and also Boult was average in recent series. Nope not this FTB there are plenty way more entertaining batsman AB is best in this aspect! Nobody comes close to AB!! Did u even see that 150 match against SA ? Dont just simply say It was a flat pitch. Its ok not to like somebody. But to degrade even his best knocks is not called for. THe word "flat wicket" is used willy nilly. To digress between Rohit and Rahul, Rahul was aesthetically better with his sixes compared to Rohit in this match. He is so good to watch when he hits sixes. I don't understand what are you saying. Anyways, I am not degrading anyone. But I can't do much when there is so much of insecurity among fans for their players. Lala was the most entertaining batsman of the last three decades. Rohit Sharma is a bit of complicated fellow. Watching him gives you a pukka FTB vibe. When something is there in the pitch, he really really struggles. 1. One of his best knocks was against Herath on a heavy turner in WI-SL-India tri series final. 4. Another one was in 4th ODI against England in Mohali where we chased down 257. It was a good pitch with the ball doing a bit. In all these 5 knocks, Kohli failed badly to give you an idea of how it wasn't easy. Other important knocks include his 200 in a decider match (7 match series) against Aus 2013 ODI series, his recent 200 in the 2nd ODI of SL series with the series on line, knocks in CT 2013, CT 2017 and more if I dig around. With that being said, this doesn't mean Rohit is some kind of clutch performer who can turn it on when the team needs him. The fact is inspite of all these heroics, Rohit doesn't inspire confidence. 1. He bats too slow at the top (his 171 at 100 SR in MCG looks great on stats and has amazing shots but it wasn't a great knock in the match context where the pitch was a belter to the core). 3. Not mentally strong as a batsman who doesn't usually tough it out. If it's a day where he is destined to do it, Rohit will uproot trees. Or else, he will fail. As a CSK fan, in a crunch situation against MI, I always used to back Rohit to fail and he used to do. That image hasn't yet been shaken off. That's why opinions are divided upon him. In a certain way, he is terribly under-rated when he is carrying the burden of Indian cricket ODI team along with Dhawan and Kohli (I include myself in this category). In other ways, he is terribly over-rated who is lucky to play in the era of the flattest ODI pitches with tons of opportunity to stat boost in tourneys against minnows (I just can't imagine him on 90s pitches against good bowlers....just can't picture him succeeding barring a few games cos he neither is mentally strong or is his game tight enough). Depending on the way you look at it, Rohit can be amazing (I still can't forget his Deccan Charger knocks) or he can be rubbish. Rohit is like the Donald Trump of batsmen. You either adore him or despise him. Last edited by sensible-indian-fan; 23rd December 2017 at 20:10. He also scored the only 50 on a green pitch in a virtual quarter final in the t20 world cup in SA. Milking C-grade bowling? No thanks. He's not any better than what Afridi used to be. Rohit is definitely not an FTB. He has little bit of starting trouble especially against left arm bowlers who can angle the ball. But once he is in it doesn't matter left or right he can take anyone to cleaners. You have to give benefit of doubt to those who are not natural openers. On a true wicket when the ball comes on he can be a monster. Last 5 year record by different players against Australia who have been one of the top teams consistently. He has hit 57 sixes. AB also has had the luxury of coming in late in the innings to finish a better platform built by one of the best top orders in world cricket in recent years, while Rohit is a fundamental part of building THE best top order in world cricket. It's easy to slate Rohit for taking his time to set up the innings but isn't that part of his role? We'd slate him for immaturity if he went too aggressive early on in his innings, I think it's an unfair comparison to throw him in with someone who bats at 4 or 5. Fact is Rohit has proven his highest gear is as high as anyone, period. Rohit sharma is probably FTB.But calling him biggest FTB is wrong.He can play well on slow(like 5th odi IND vs NZ 2016) and even slightly bouncy pitches(like 79*(46) in 2010 t20WC or MCG ton). He is certainly Not one of my favourite player mainly because i don't find him as reliable batsmen.However,I can undertand if someone finds him entertaining. Last edited by Savage; 24th December 2017 at 12:17. ATM,he is nowhere near ATG in any format. Only Warner comes close but Rohit trumps him in six hitting ability. 140 sixes jeez! Last edited by Cricfan4eva; 24th December 2017 at 13:51.
he has the lazy Elegance and that Elegance will cost him to become an ATG. 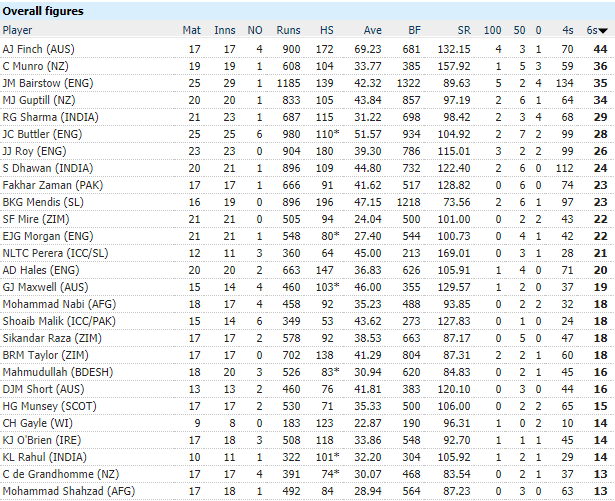 Not an ATG but third best batsmen from his era in odis. He is certainly not better than AB,Kohli and dhoni in ODIs. He is better than dhoni in odis at the moment as batsman not as player though. Last edited by Savage; 24th December 2017 at 21:57. I forgot Dhoni as he is remembered more for his legacy as a captain, keeper and then batsmen all combined.Also, they dont match each other's era. So, yes Dhoni is obviously ahead of Sharmaji. How many sixes in this year? Rohit Sharma becomes the first batsman in history to score 3 centuries in each format of international cricket - 3 in Tests, 17 in ODIs, 3 in T20Is. He is the most clutch opener right now and with an extra gear nobody possesses. Should finish as an ODI great. One of the, if not the most entertaining. Aesthetically pleasing to eyes as well. He makes batting look so easy... The ball pings off his bat. Last edited by Aman; 13th January 2019 at 09:32.